﻿The explosive demand for A/V technology in corporate and educational environments requires a fundamental change from the current providers of this technology. The days of custom designs, custom integration, and custom “one-off” programming will soon be a thing of the past. There is also an immediate need for A/V solutions that are rapidly deployable, scalable in mass, cost-effective, and IT-supported. 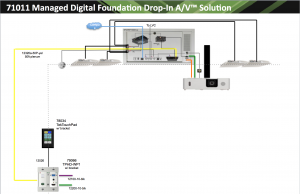 TEKVOX Drop-In A/V® solutions are the perfect match for solving both of these problems. Drop-Ins are effectively “room solutions in a box” that alleviate all the usual problems that stem from operating and maintaining A/V-managed rooms. TekPatrol, Drop-Ins, and TekEnterprise are currently used in thousands of classrooms and conferences rooms today. They provide significant financial benefits to users in the form of reduced cost for acquisition, installation, and operation. Click here for a more in-depth look at TEKVOX solutions. 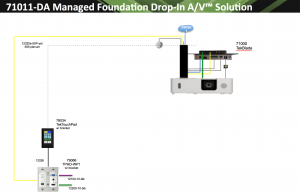 Part Number: 71011-DI Everything needed to set up a single room including remote administrative management, control, and automatic system shutdown.